Q. The beetle traps we set out in our yard were filled to overflowing at least a dozen times last year! And, we’re pretty sure that the grubs they laid killed large parts of the lawn surrounding our new home. However, because we have three young children that play out in the yard all the time, we don’t want to apply poisons to our yard to kill the grubs this year. I’ve seen a natural product called “Milky Spores.” Will it kill the grubs without harming the environment - or more important, our kids? A. I hate to say it, but you may have contributed to the swarms of beetles by setting out traps in your yard? They're so effective at attracting beetles that many of those that ended up in your yard might otherwise have made their home in the yards and gardens of your neighbors. So the first step in managing Japanese beetles in the future is to never again set out traps in your yard! 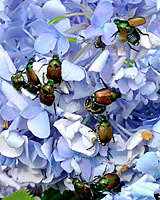 Second, the milky spore bacteria (Bacillus popilliae) has been used to reduce Japanese beetle populations for more than 60 years. However, it's most effective in the mid-Atlantic states and points south where soil temperatures remain high for long periods of time, allowing it to spread more efficiently. Also, milky spore is not effective against European chafer grubs, which are often more common and more damaging in Central New York lawns than Japanese beetle grubs. For these reasons, I can't recommend milky spore as a grub control product for Central New York lawns. On the other hand, a naturally occurring, entomopathogenic nematode, Heterorhabditis bacteriophora, (say that three times fast) has been shown under some conditions to provide fairly effective control of several grub species. Once applied to the soil, these microscopic, worm-like critters enter the bodies of grubs and release toxin-producing bacteria into their gut. And, no, neither the nematodes, the bacteria, or the toxin that the bacteria produce will harm your children. Because these nematodes are alive, they must be shipped, stored and applied under very precise conditions to be even marginally effective. In addition, they’re not inexpensive – thirty to forty dollars per 1,000 square feet, or roughly two to three hundred dollars for a typical-sized lawn. Should you decide to use nematodes to control grubs in your lawn, they must be ordered and applied by early to mid-July as they’re most effective against very young grubs – which start hatching during the first week in August across much of upstate New York.